Mornington soccer coach Nick Cook originally came up with a product to be used as a tool at training, but it didn’t take long to realise the potential he was sitting on. 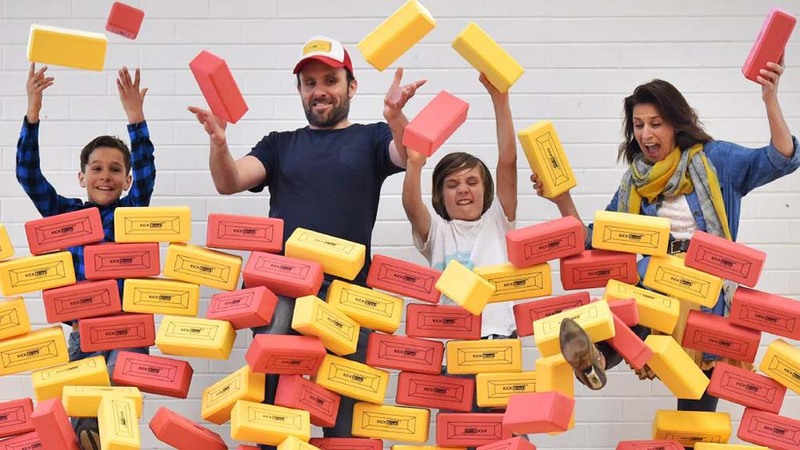 Inspired by the different ways in which his young trainees were using the soft toy bricks he had laid out for drills, Nick set to work on creating the KICKBrick brand, packaging up those bricks and selling them for kids to use for whatever their wild imaginations can come up with. “I run Little Kickers, which is preschool soccer from 18 months to 7 years. Basically, in the classes we were looking for something for kids to be able to knock down safely, defend, and attack. We were looking for something fun and safe that we could use, so we just decided to source and make our own and it went from there. The bricks have rounded edges, and they’re soft and safe,” Nick said. Established just over a year ago, the bricks quickly outgrew their purpose to be used simply in soccer training. Now the bricks are manufactured with the intent of making them as multi purpose as possible, so kids can play with them in any way that they can think of. “It was probably early 2016 when we started to package up the bricks and offer them for sale, but back then it only started as a one off sort of thing. Because of the interest and what the kids were doing with them, it’s now grown into something more,” Nick said. “We wanted something big and stable enough for these kids to build up, so the brick size was perfect. It’s such a good open-ended toy. 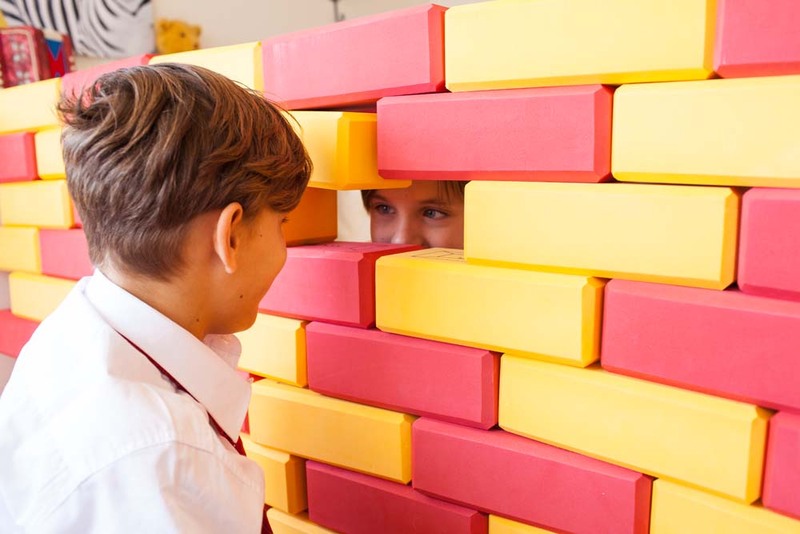 They can be used to brick up the doorway, build a tower, pretend the floor is lava, create targets and mazes; there’s so much that kids can do to be creative with them. You can use them inside and outside, in water, and they’re easy to wipe clean. 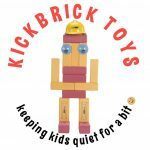 Strong positive feedback from customers spurred Nick to continue to try to expand KICKBrick’s reach, and now the bricks are popping up in all sorts of places for all sorts of purposes. “Lots of parents have been buying them. We’re in primary schools, kindergartens, toy libraries, and Scienceworks has about 1500 bricks in one of their exhibitions. The bricks were also voted a hot product on Channel 10’s The Living Room. One area where they’ve gone down really well is with occupational therapists because they’re seen as a good active toy where kids can place aggression in a safe environment, and use them to break down barriers. We sell lots of them through therapy stores because they’re seen as great for kids with disabilities,” Nick said. Nick is also a father of two, and credits his two young boys as being the first ones to try out and give their tick of approval to the bricks. “I’ve got two boys. They helped in the beginning with the testing. They were the ones who first got them out to start bricking things up and kicking them down. They’re very active boys and they were my original testers,” he said. Nick also says he works hard to restrict the disposable plastic used in putting the bricks together in order to cut down on waste, and he also says that the brand is dedicated to causes that help make a difference in the world. “The bricks are designed here in Australia, and they’re recyclable too. There’s so much rubbish and disposable packaging out there these days when it comes to toys, so we wanted to restrict the amount of disposable KICKBrick packaging. You use the bag it comes in to store them and the boxes can be used as part of the play; there’s instructions to cut a hole in the boxes to make them into a door that you can use as part of playing with them. We wanted to incorporate as much functionality as we could so there would be as little to throw away as possible,” he said.